After the two Hiway trucks were off loaded at Mossleigh, Alberta, the tender was reconnected to the engine. 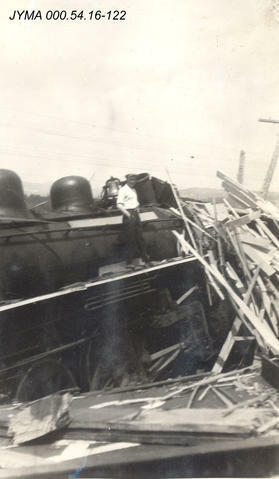 The engine was then prepped for rail movement to Aspen Crossing. Naturally this involved lubricating the driver axles with fresh grease. Usually a simple process. Not so this time. After years of sitting in a park, the grease had solidified into concrete hardness. The usual method of pumping fresh grease into the fittings...did not work. The old grease would not budge from the axles. The solution was to allow the drivers and axles to sink down under their own weight, as the engine was being lifted by the giant cranes. This worked, and fresh grease was flooded in around the bearing surfaces. Safely lubricated, the engine was towed to its new home by ex CNR 8454....an S3 Alco. Constructed by Montreal Locomotive Works in 1952. Spent many years in Canadian Prairie service. Now the perfect stablemate for 5080. BTW. That's Al Broadfoot inspecting the grease cellars. The remedy worked, and 5080 arrived safely.....Now parked outside Jason's office window at Aspen Crossing. Were the pistons greased as well? The grain elevator in the collection is a nice statement about CNR service on the prairies. Let's talk about the long range projections for the locomotive. The pistons and the valves were heavily lubricated with oil. Including cross-heads and guides. Also the piston and valve packing was removed. The engine was moved slightly ahead, and relubed several times to distribute evenly over the bearing surfaces. It was done this way, as the move was only about a mile, and done at very low speed. Simpler this way. It worked fine. Inspection on arrival showed no damage to bearing surfaces. In answer to your other question. First thing is removal of fittings, the jacket, and handrails, etc, so the actual condition of the boiler can be properly evaluated by ultra sound and hydro test.. Everything depends on that. When the true condition is known, the project will proceed. Initial visual inspection would indicate a good boiler...But...you never know. 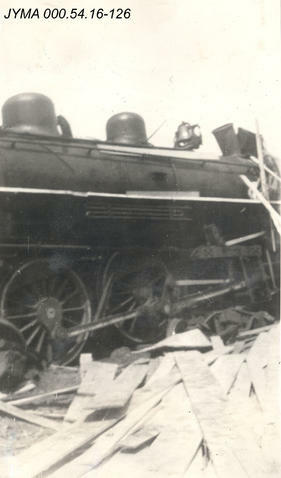 At this time, the long term plan is to have it rebuilt to operating condition. And, of course, it has its own railway to run on. That sure is a good looking locomotive, even the tender trucks. Yes, they were a good looking loco's...as this July 1947 'net photo shows. Grand Beach, Manitoba. 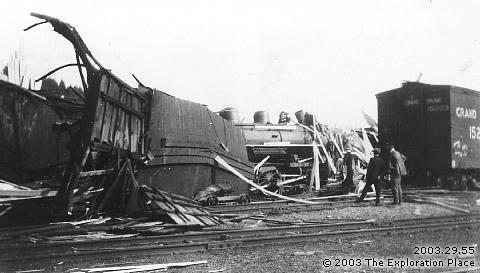 Montreal Locomotive Works. April 1914 J-4-a. Is the asbestos still on it or was it removed previously? It wasn't all sunny days for the 'ol #5080. Last edited by RoyalwithCheese on Sat Apr 06, 2019 2:08 am, edited 1 time in total. The move. Yes, everything was well lubricated and under the constant watchful eyes of Al Broadfoot. RwC. Thank you for posting those Jasper shots. That video link nicely shows the slow pace of the move, and the valve gear doing its thing. Have you any more info about the Jasper incident ? Recent close inspection of wear patterns under the engine, strongly suggest, for a road engine....it spent an inordinate amount of time backing-up. As in switching duties. Do you think the Jasper shots show it in possible switching service..? OldSmokey - From what little info I could find, the pics from Jasper are the result of a runaway. #5080 got away from the hostler and decided to go for a jaunt. I know that engine inside and out, I'm one of the ones responsible for it going to Aspen Crossing. I've been working on making something happen with #5080 since 2005 and have built up a very large research file on the locomotive. In regards to the tread wear, Al Broadfoot and I discovered the unusual wear on the pilot and trailing truck when we did our preliminary mechanical inspection several years ago. 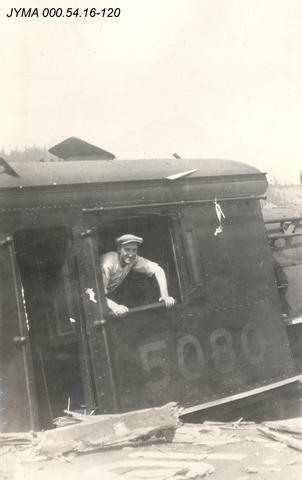 I dug through my records afterward and found near the end of it's career, the engine was assigned to local assignments around Price Albert that required it to push and pull loaded lumber cars for the local paper mill. Knowing the terrain and the routine from the diesel era, I assume it pulled the loads to the mill (some of it up a two way grade), cut off, ran around the train, pushed/spotted the cars and pulled the empties backward into P.A. A couple of years of that with the sanders on would account for the grooving. That Jasper mill switching job, would certainly account for the bull-flanging of the tires. I was told today, this is bad news for the wheels, as it restricts the lateral movement of the drivers. Instead of the entire wheel set moving side to side with changing track conditions, the lateral load is absorbed by the spokes, causing them to constantly bend back and forth. They were not designed for that. Cracks can appear at stress points. The tires need to be re-profiled, to eliminate the deep groove, that stops the driver moving properly side to side over the railhead. The Jasper assignment was way back in 1925. Any wear from that job would have been dealt with long ago. If you take a look at the driver tires, they are dated 1948 - that's when it had a major backshoping and was converted to oil. It was in the shops again in 1955 when it had a new crownsheet installed (we know this because the welder left his initials and the year in stick just above the firebox door, inside the firebox). I'd have to take a look at my notes, but if memory serves me correctly the L.H. trailing truck tire is dated 1952 and the pilot wheels are dated 1948. The pilot wheels, drivers and the trailing truck are all dished, BUT the good news is that they have plenty of 'meat' left on them, enough to be turned down and still be well above condemning limits. PS - speaking of notes, there's an interesting little scribble written inside the smokebox on the fireman's side, written by the P.A. roundhouse crew 'to the future' back before the engine was parked on the fairgrounds back in the '60s. Al and I were the first people in there when we opened the front end a few years back. There's also a spare exhaust nozzle splitter bolted to the inside as well, something we've never seen before. I love those photos of the Jasper incident. 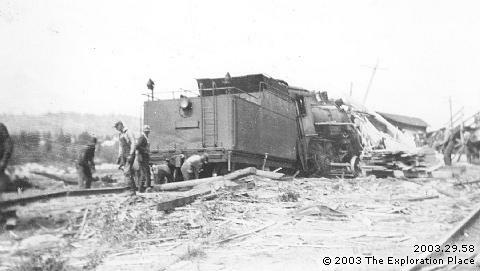 That poor boxcar. Hope no one was hurt. Gonna have to make a trip down to Mossleigh this year, been putting it of for far too long. Congrats to everyone involved, you've done a great job so far. Keep up the good work! Old Smokey - you are correct about the dishing affecting the lateral. Everything on a steam locomotive is interconnected in some way. If a component is worn or broken, the strain will be transposed onto another part, and so on down the line. On #5080, the dishing is repairable, just one of the many small things that needs attention. Speaking of the spokes, they all checked out OK. I've got a locomotive inspector's hammer made out of a softer cast metal - a trick to check for cracked spokes is to tap each spoke and if it is good, the spoke will ring musically like the keys on a xylophone. If there is a crack, it will just make a dull thud. Everything on #5080 rang true. I know it is no substitute for magneflux, but it was a good preliminary indication all was well.